Pork scallopini with apples and sage from Melissa Clark is a quick, marvelously autumn-y dish. Apples are sauteed in butter until soft, then pounded slices of pork are seared in the same pan. Sage completes the dish. You tell us whether the best part is the taste or just one skillet to clean. 1. Season the pork with salt and pepper to taste. 2. In a large skillet over medium-high heat, melt the butter. Add the apples, sugar, cinnamon, and 1/2 to 3/4 teaspoon black pepper. Cook, stirring occasionally, until the apples are tender, 7 to 15 minutes, reducing the heat as necessary. The timing will depending on the variety of apple and the flame beneath your skillet. Stir in the vinegar and cook for 1 minute more. Transfer the apples to a plate. 3. Return the skillet to medium-high heat and add 1 1/2 tablespoons olive oil. Stir in 3 garlic cloves, 2 anchovies, and 8 sage leaves and cook for 15 seconds. Add 3 pork cutlets to the skillet and cook until well-browned and cooked through, 1 to 2 minutes per side. Add a few spoonfuls of water to the skillet to help scrape up any browned bits from the bottom. Transfer the cutlets and juices to warmed serving plates. Repeat with the remaining oil, garlic, anchovies, sage, and pork. 4. Scatter the apples on top of the cutlets and drizzle with the pan sauce. Serve immediately. 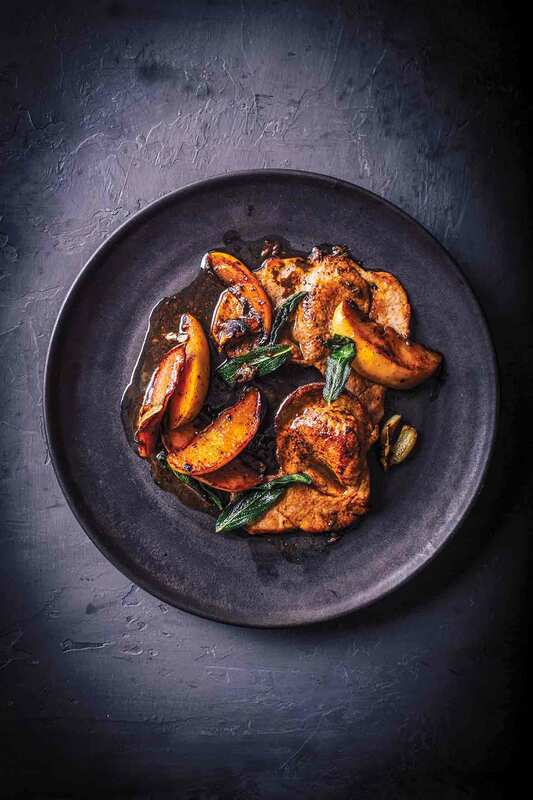 This pork scallopini with apples and sage is a homey dish that can be both for a family-night meal and as a company dish. Everything came together quickly and was very wonderful to eat! I'll definitely make this dish again! The slightly crunchy exterior to the apples with the cinnamon and sugar gave everything that sweet and savory touch. If desired, I think a little more cinnamon and sugar could be dusted on the apple wedges. (I did!) I sautéed the pork cutlets for 2 minutes per side and cooked them in 2 batches as suggested. At first, I didn't think there would be enough pan sauce with just adding water to the pan drippings, but it made a wonderful glaze for the cutlets. The pork cutlets can be pounded out ahead of time and the apples caramelized and removed to a separate plate and left at room temperature to make the final cooking go very fast. I did use the anchovy fillets. I wondered about it at first, but they gave the final glaze a rich and darker color as they melted into the pan drippings. I served the pork with wild rice and roasted asparagus. The flavors of these pork scallopini with apples and sage in this were a knockout. The anchovies melted into the pan juices and were indiscernible as anchovies, but they added an umami kick that elevated the resulting dish beyond the everyday. I used 1 Honeycrisp and one Granny Smith apple. This was served with several mezze to start (baguette slices, hummus, rice-stuffed grape leaves, and marinated gigande beans) and baked potatoes with sour cream. What a quick and easy meal to prepare! I so appreciate having a tasty meal that you cook from scratch, and can still put something great on the table, in not much time at all. This is a perfect weeknight dish to make. In the time it took for my apples to become tender, I made some potatoes in my IP (Instant Pot), gave a quick sauté to some snap peas, and voila, a complete, wonderful meal was served. If you’re not a fan of black pepper, you might need to cut back on the amount called for in this recipe. For some 3/4 teaspoon might be too much. It was very pronounced, however, and we loved it. It might just be a good idea to mention it. I found that Trader Joes has very nice boneless pork chops or cutlets in 2 different cuts, thin ones and thicker ones. The thin ones were perfect to use in this recipe. They did not take much pounding to get them to the correct thickness. I used Gala and Pink Lady apples are one of my favorites. The garlic cloves and sage leaves were fabulous. Note to self: Next time, and there will be a next time, add extra sage leaves and garlic! Lots of both! However, we were not thrilled with the taste of the anchovies in this dish. I like anchovies when they meld with other ingredients. Here, they just stood out as fishy. I will not use them when I make this recipe again. My kids and I really enjoyed the combination of the crispy sage leaves and the slightly sweet apple with the pork. This recipe packs a big umami punch with the anchovies so do not be afraid to try them! Although I was intimidated by the furry little guys so I used anchovy paste. One anchovy fillet is approximately equal to 1/2 teaspoon of anchovy paste. You do not taste the fish and it lends a rich nutty complexity to the dish. I think the recipe serves 4 people if they are not hungry. If you have a family with an appetite I think it would make more sense to throw in 2 more pork cutlets for a total of 8 without needing to make any other alterations to the recipe. I used Granny smith apples. Next time I would not add sugar to the apples as it’s unnecessary. To save time, I worked with a couple large skillets at once, dividing the recipe in half so that each skillet had about 1/2 the recipe in it starting with the apples. This way the apple juices and the tang of the vinegar were evenly distributed between the pans. I served this with garlic-infused olive oil and spinach on the first day and on the second day we had it with spinach mashed potatoes. I think that it would be delicious with Cheddar polenta or grits! We were severely impressed by this simple recipe for pork scallopini with apples and sage! 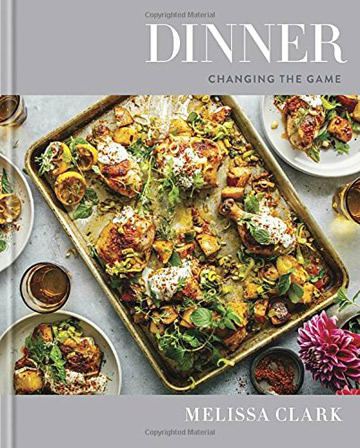 As the cook, I was impressed with the ease of which everything came together, and as diners, my husband and I were both impressed with the overall depth of flavor of the finished product. And don't skip the anchovies here! The combination of the melted anchovies with the olive oil, pork, garlic, and sage was unbelievably yummy. In fact, if you’re a bit hesitant to cook with anchovies, this should be your test recipe that shows how non-fishy they really are—they merely add a richness that is super tasty. I also loved that cooking the garlic cloves, sage and anchovies in the hot oil first gently fries up the sage, making it release its flavor, but also become a bit crisp. I served this lovely dish with a rice pilaf studded with almonds and parsley, and some sauteed Swiss chard with radishes. I adored this recipe and will certainly be making it again and again! This easy recipe is such a confidence builder—it really pares down scallopini to an approachable method that you will want to use again and again. No dredging. A fruity tartness supplies the right touch of acid and sweet. And if you use pork tenderloin, you can slice medallions and quickly pound them with a wooden mallet or rolling pin and have dinner on the table in under a half hour. The anchovies disappear completely and add a wonderful depth to the sauce. The sage adds another lovely note. The thin pork beautifully cooks in a minute or two each side. For dinner we served this over a bit of buttered linguine, letting the sauce from the scallopini and apples drip down an flavor the dish. Great cold weather dish with a nice simple black pepper seasoning. The cinnamon and sugar are just part of the whole flavor along with the anchovies, not a distinct or distracting note. Bonus method mastery: What I liked was how straightforward this was, really no fuss at all. Since my tenderloin weighed a bit more than what I needed for dinner, I saved the ends I had removed to square up the meat, and pounded them out the next morning and made a version of this same dish adding a sliced shallot with the apples and omitting the sage to serve with poached eggs and toast. Such an easy spur of the moment meal yet really special, and something I would serve as brunch for a crowd. Pork Scallopini with Apples and Sage Recipe © 2018 Melissa Clark. Photo © 2018 Eric Wolfinger. All rights reserved. All recipes and photos used with permission of the publisher.